"Jewel Match: Solitaire L'Amour has to be one of the best solitaire games I have ever played. I'm not a fan of classic solitaire, but I am going crazy over these new types of solitaire. I will be buying a lot of these games. Can't wait to see what you come up with next." Enter the enchanting world of Jewel Match as you fall head over heels for this charming solitaire adventure. Discover and rebuild five gorgeous scenes as you follow each passionate couple across the land. Play 200 levels, plus 50 bonus Mahjong levels to unlock. Dozens of game play variations add to the classic Solitaire, such as obstacles, power-ups, frozen cards, and more. Search every last level for gems and coins that you can use to purchase new upgrades for each scene, plus aim for the elusive Perfect in each level. 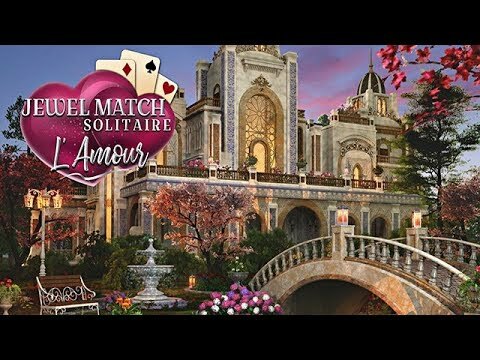 Bring your sweetheart and a deck of cards, because love is in the air in Jewel Match Solitaire: L'Amour. I was very skeptical about this game at first. I thought it would just be another run-of-the-mill card game, but boy was I wrong. It's not just solitaire, there is so much more to it with the magical cards to unlock. It's a game of concentration and strategy, not like most card games based on luck. This game is so addictive, I could not stop playing it. My early nights have gone out the window because of this game. I really do recommend it to anyone who likes to use their brain and likes spending hours playing card games. You definitely won't be disappointed. I like this game very much. In fact, it is hard to stop playing it. I have spent hours playing it already. Thank you. This is one of the best solitaire games I have ever played. The jewels and other locked cards that you have to release add some pizzazz to the game.